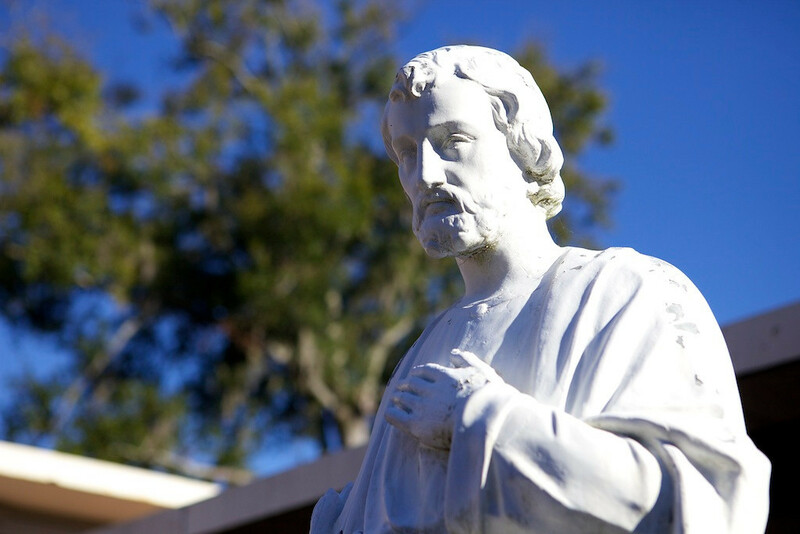 St. Francis Xavier Catholic School is a Christ-centered school built on a strong foundation of Gospel values, empowering all to lead faith-filled lives. Founded by the Sisters of St. Joseph, St. Francis Xavier School began as St. Joseph's School and was established in Brunswick in 1900. Reverend P. J. Luckie, S.M., requested Rt. Reverend Benjamin J. Keiley, D.D., Bishop of Savannah, open a Catholic school in St. Francis Xavier parish. The Sisters of St. Joseph started and staffed the school in September of that same year. A former boarding house on the corner of Richmond and Howe streets became the first school and opened with 60 pupils. Even in the beginning, this number of children proved to be too many for the building to accommodate. In the spring of 1902, the parish purchased the property for and work began on the colonial-type building that served as a convent and school for so many years. In 1953 a new convent, designed by C. M. McGarvey, was built for the sisters. In 1955 Reverend James Cummings, S.M., initiated the construction of a new, larger school. The new name, St. Francis Xavier School, replaced that of St. Joseph School as a tribute to the people of the parish who generously supported their parochial school. Our existing red brick school located at 1121 Union Street originally consisted of eight classrooms, a kindergarten, cafetorium and kitchen, library, book supply room, lavatories, principal's office, health room, and teachers’ lounge. The main building surrounded a courtyard. Two new classrooms were added in 1964. Since then further expansions included buildings for a kindergarten and preschool and a parish hall that the parish and school share. Our dedicated faculty and staff at St. Francis Xavier School work daily to continue the mission of the Sisters of St. Joseph. Born in the family castle of Xavier, near Pamplona in the Basque area of Spanish Navarre on April 7, Francis was sent to the University of Paris in 1525. He secured his licentiate in 1528, met Ignatius Loyola, and became one of the seven who, in 1534 at Montmartre, founded the Society of Jesus. In 1536 he left Paris to join Ignatius in Venice, from whence they all intended to go as missionaries to Palestine (a trip which never materialized). He was ordained there in 1537, went to Rome in 1538, and, in 1540, when the Pope formally recognized the Society, was ordered, with Fr. Simon Rodriguez, to the Far East as the first Jesuit missionaries. There King John III kept Fr. Simon in Lisbon, but Francis, after a year's voyage, six months of which were spent at Mozambique where he preached and gave aid to the sick, eventually arrived in Goa, India, in 1542 with Fr. Paul of Camerino, an Italian, and Francis Mansihas, a Portuguese. There Francis began preaching to the natives and attempted to reform his fellow Europeans, living among the natives and adopting their customs on his travels. During the next decade he converted tens of thousands to Christianity. He visited the Paravas at the tip of India, near Cape Comorin, Tuticorin (1542), Malacca (1545), the Moluccas near New Guineac, Morotai near the Philippines (1546-47), and Japan (1549-51). In 1551, India and the East were set up as a separate province and Ignatius made Francis its first provincial. In 1552 he set out for China, landed on the island of Sancian within sight of his goal, but died before he reached the mainland. Working against great difficulties, language problems (contrary to legend, he had no proficiency in foreign tongues), inadequate funds, and lack of cooperation, and often actual resistance from European officials, he left the mark of his missionary zeal and energy on areas that clung to Christianity for centuries. He was canonized in 1622 and proclaimed patron of all foreign missions by Pope Pius X.